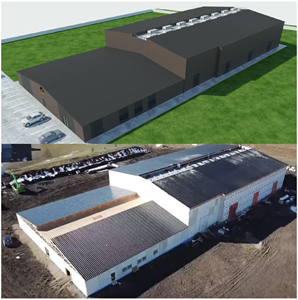 CALGARY, Alberta, Oct. 10, 2018 (GLOBE NEWSWIRE) -- SugarBud Craft Growers Corp. (“SugarBud” or the “Company”) (trading as Relentless Resources Ltd.) is pleased to provide an operations update regarding its state-of-the-art vertical cannabis cultivation facility at Stavely, Alberta (the “Facility”). The Company is also pleased to announce that it has filed a filing statement (the “Filing Statement”) under SugarBud’s profile on SEDAR at www.sedar.com with respect to the Company’s planned “Change of Business” pursuant to the policies of the TSX Venture Exchange (“TSXV”). SugarBud is pleased to announce that Phase 1 of the Facility has been erected by ConstructShieldTM, with direct assistance from Gunther’s Masonry Construction Ltd. Construction is currently underway on the interior of the building, including the inner walls, electrical, mechanical, plumbing and other components of the Facility. See Exhibits 1 and 2 for pictures of Phase 1 and Exhibit 3 for a drone video of Phase 1. 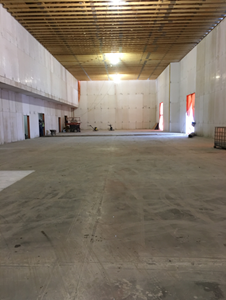 Upon completion of the interior, Phase 1 of the Facility will be comprised of an administrative and service area, a nursery, and eight 2,200 square foot flowering rooms. Each flowering room will have isolated HVAC and environmental controls, allowing SugarBud to “fine-tune” the temperature, humidity and air-circulation for each room, with the intent of maximizing product quality on a strain-by-strain basis, and limiting the impact of any potential pest or pathogen infestations. SugarBud is working diligently to equip the first growing room (“Phase 1A”) by the end of calendar 2018. 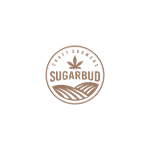 Subject to the receipt of cultivation license from Health Canada, SugarBud will then commence the cultivation of cannabis with the intent of obtaining a sales license (“Sales License”) under Health Canada’s Access to Cannabis for Medical Purposes Regulations (ACMPR), and/or other Cannabis Regulations, as soon as possible thereafter. In order to accelerate the receipt of a Sales License, the Company will equip the seven remaining Phase 1 flowering rooms (“Phase 1B”) concurrently with the production of cannabis in Phase 1A. 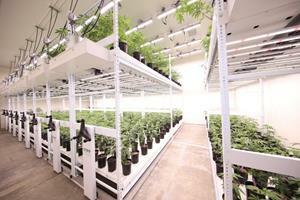 The Company is targeting to obtain its Sales License and the completion of all eight Phase 1 flowering rooms by mid-2019. The Company will commence construction of Phase 2 when capital permits. It is expected that the Company will have the capital required to fully-construct Phase 2 upon the syndication and finalization of the previously announced $17.65 million credit facility (“Credit Facility”) with Farm Credit Canada (“FCC”). The Company is currently in negotiations with a Canadian financial institution regarding the syndication of the Credit Facility. Phase 2 consists of two “wings” constructed on the side of Phase 1. See Exhibit 4 for an illustration of the Phase 2 “wings” in relation to Phase 1. SugarBud anticipates being able to achieve the strong production metrics noted above due to the utilization of aeroponics and vertical growing technology. In order to maximize control of the growing environment, root formation, and ultimately enhance cannabinoids, trichome production, terpene profiles and yield, the Company will utilize an aeroponics growing system (the “Aeroponics System”). It is anticipated that the Aeroponics System will reduce water usage, increase nutrient uptake, accelerate the vegetation and flowering cycles and optimize the number of crops harvested per year. 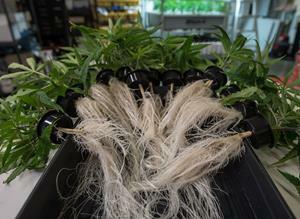 See Exhibit 5 for an illustration of cannabis roots grown in an aeroponic environment. In order to maximize the utilization of the Facility’s floorplate, and the efficiency of the capital deployed, SugarBud is utilizing vertical growing technology. It is anticipated that SugarBud will achieve a flowering floorplate to flowering canopy ratio in excess of 160% using vertical racking with three layers. Please see Exhibit 6 for an illustration of the vertical racking system to be employed by SugarBud. Note that Exhibit 6 illustrates vertical racking with soil as opposed to SugarBud’s planned aeroponics system. SugarBud is pleased to announce that it has filed the Filing Statement in respect of its previously announced “Change of Business” pursuant to the policies of the TSXV. It is expected that the Company will achieve final approval of “Change of Business” from the TSXV on or about October 17, 2018 (the “Expected Final Approval Date”). Upon receiving final approval of “Change of Business”, SugarBud will proceed to close a series of transactions (the “Transactions”) that constitute the “Change of Business”. The Transactions include, without limitation: (i) the completion of its rights offering to holders (“Shareholders”) of common shares of SugarBud (“Common Shares”), the results of which were announced on September 20, 2018; (ii) the acquisition (the “Acquisition”) of Grunewahl Organics Inc. (“Grunewahl”); (iii) the second tranche of a strategic investment with Inner Spirit Holdings Ltd. (“Inner Spirit”); (iv) the entering into of a strategic alliance agreement with Inner Spirit that will govern the on-going business relationship of the parties; (v) the appointment of Darren Bondar, Chief Executive Officer of Inner Spirit, as a director of SugarBud; (vi) the name change to SugarBud; and (vii) the change of SugarBud’s stock ticker from “RRL” to “SUGR”, each as is described in the Filing Statement. Closing of the Transactions is subject to a number of conditions (“Conditions”) including, but not limited to: final TSXV approval of the Change of Business; approval of the Transactions by greater than 50.1% of Shareholders by written consent; and closing conditions customary to transactions of the nature of the Transactions, including those described in the Filing Statement. SugarBud believes that the Conditions will be met prior to the Expected Final Approval Date. Upon completion of the Transactions, the Company will be listed on the TSXV as a Tier 2 Life Sciences Issuer. In connection with preparation of the Filing Statement, the unaudited condensed consolidated financial statements of the Company for the three and six month period ended June 30, 2018 have been reviewed by an independent auditor. Concurrent with the filing of the Filing Statement, the financial statements were refiled on SEDAR at www.sedar.com to exclude the original disclaimer indicating the financial statements had not been reviewed by an auditor. Completion of the Transactions is subject to a number of conditions, including but not limited to, final TSXV acceptance. There can be no assurance that the Transactions will be completed as proposed or at all. Investors are cautioned that, except as disclosed in the Filing Statement, any information released or received with respect to the Transactions may not be accurate or complete and should not be relied upon. Trading in the securities of SugarBud should be considered highly speculative. This news release may include forward-looking statements including opinions, assumptions, estimates, the Company’s assessment of future plans and operations, and, more particularly, statements concerning the completion of Phase 1A of the Facility; the quality and yield of cannabis to be grown in the Facility, including pursuant to the Aeroponics System and vertical growing technology; the construction of Phases 1B and 2 of the Facility; potential sources of funding of Phase 2, including advances under the Credit Facility; the completion of the Transactions; and the trading in the Common Shares under the new name and new symbol. When used in this document, the words “will,” “anticipate,” “believe,” “estimate,” “expect,” “intent,” “may,” “project,” “should,” and similar expressions are intended to be among the statements that identify forward-looking statements. The forward-looking statements are founded on the basis of expectations and assumptions made by the Company which include, but are not limited to, the timely receipt of all required securityholder, TSXV and regulatory approvals and the satisfaction of other closing conditions in accordance with the terms of the amalgamation agreement entered into between SugarBud and Grunewahl and the investment agreement entered into between SugarBud and Inner Spirit. Forward-looking statements are subject to a wide range of risks and uncertainties, and although the Company believes that the expectations represented by such forward-looking statements are reasonable, there can be no assurance that such expectations will be realized. Any number of important factors could cause actual results to differ materially from those in the forward-looking statements including, but not limited to: regulatory and third party approvals, including receipt of cultivation and sales licenses from Health Canada, not being obtained in the manner or timing anticipated; the ability to implement corporate strategies; the state of domestic capital markets; the ability to obtain financing; changes in general market conditions; industry conditions and events; the size of the medical marijuana market and the recreational marijuana market; government regulations, including future legislative and regulatory developments involving medical and recreational marijuana; construction delays; competition from other industry participants; and other factors more fully described from time to time in the reports and filings made by the Company with securities regulatory authorities. Please refer to the Filing Statement for additional risk factors relating to the Company. The Filing Statement is accessible under the Company’s profile on www.sedar.com.